Fascinating observations on manhood and womanhood, in two posts from Tim Chester (combined together below for ease). This is a bit of work in progress, but I thought it might be of interest and might provoke some discussion. It’s a diagram to help Christian men think through what it means to be a godly man. I wonder whether you can plot models of manhood along two axes: (1) the axis of proactivity and passivity; and (2) the axis of sacrificial service and selfishness. Godly manhood involves both proactivity and serving. In other words, taking the initiative to serve in the home, in the church and in the wider community. 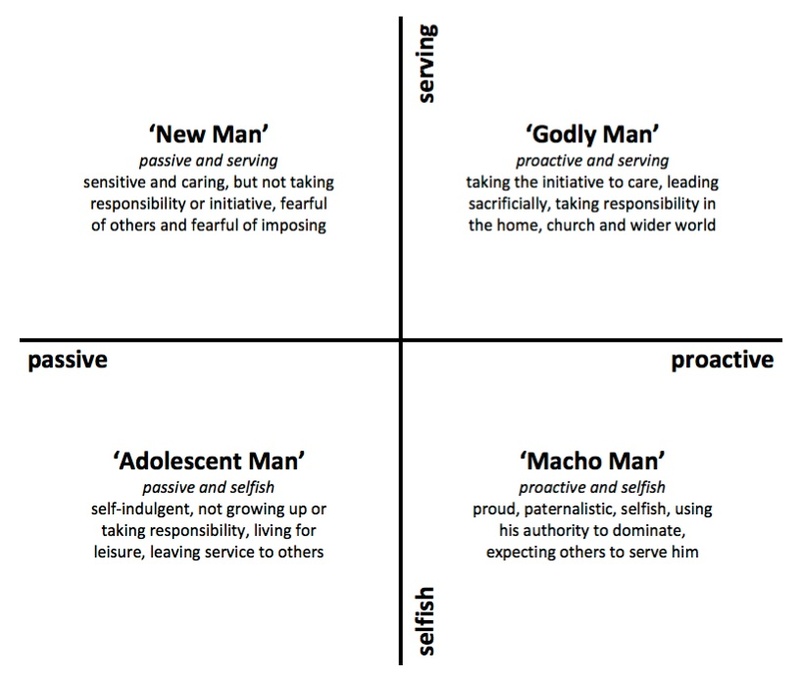 We can get manhood wrong by (1) sliding down the proactivity-passivity axis into passivity (‘new man’) or (2) sliding down the service-selfishness axis into selfishness (‘macho man’), or (3) both (‘adolescent man’). There’s a PDF for the Four Models of Manhood here that you could use as a worksheet with a man or a group of men. I’m a complementarian. But I don’t always like what some complementarians say about biblical manhood! I think sometimes some people can stress the importance of leadership without also stressing the need to use power to serve others. I think this diagram may help correct this without over-reacting and creating passive men. I think we have a growing problem of young men in the late teens, twenties and evening their thirties who have not grown up. The adolescent teenager is a twentieth century phenomenon. Before that boys went from boyhood to manhood fairly quickly with not much in between. You left school and started work and that meant taking responsibility. Increasing prosperity means late teens could enjoy ‘adolescence’ – a not-a-child-but-not-an-adult existence marked by self-indulgence and self-obsession. In the 21st century adolescence is being extended into men’s twenties. So, for example, men waste their time playing on ‘toys’ like X-Box and PlayStation. Many delay marriage into their late twenties to postpone the responsibilities it entails. You could use this diagram by asking men (and perhaps their wives as well) to plot where they think they are on both axes. Then you could discuss how they could be more proactive and more serving. There’s more on these themes (though without the fancy diagram) in my book Gospel-Centred Marriage which is available here from amazon.com and amazon.co.uk. Thanks to everyone for their thoughtful and gracious comments on my models of manhood and womenhood. As a result I’ve made some further changes. I accept that the previous model for womanhood wrongly implied that women could not lead outside marriage or the church or in the absence of male leadership. 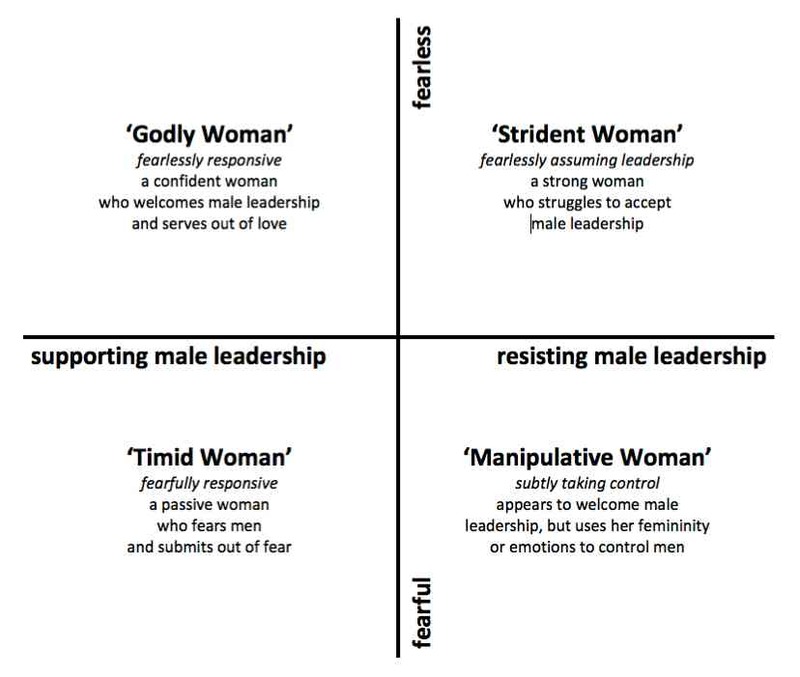 I was trying to make the leadership axis match that on the diagram for men, but the end result was misleading so I’ve given up on that. I’ve therefore relabelled the leadership axis ‘welcoming male leadership – resisting male leadership’. This still leaves the issue of leadership outside of marriage and the church ambiguous, but I’ve clarified that a little in the PDF worksheet version. So here’s the revised models of womanhood diagram (and here it is as a PDF worksheet on womanhood). Keeping Word and Spirit in balance…?